From now on, any juvenile or adult seeking assistance from the Alternative Program will need to go to the Carrie P. Meeks Comprehensive Center. Recently at the home of the inmate assistance program, located at 151 N.W. 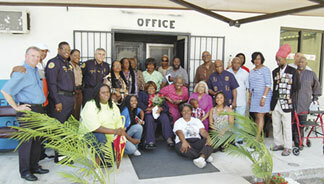 60 Street, in Miami, held a dedication ceremony to unveil the new name of the facility, honoring retired Congresswoman Carrie P. Meek. Though restrained to her wheelchair due to recent medical challenges, Meek was still able to express how humbled she was.